This is hardly the first year in which the phrase ‘customer service’ has deferred to ‘customer engagement’. Each year, it seems customers are increasingly empowered — sometimes, yes, entitled — to expect personalized attention from brands across all channels. Customer service software vendors have raced to outdo themselves to provide solutions that enable companies to understand, engage and predict their customers’ needs in real-time so that each interaction becomes an opportunity for a positive brand impression. For the Magic Quadrant for Customer Engagement Center, Gartner conducted over 150 online surveys and 50 telephone interviews with vendors’ reference customers. They also made over 1,000 inquiry calls with Gartner clients who wanted to evaluate products. They interviewed vendors, attended product demos, and interview partners, consultancies and system integrators. In other words, they did their homework. We dug through this year’s Magic Quadrant to provide you an overview of Gartner’s criteria and weightings, a comparison with last year’s Quadrant, and a summary of each vendor’s position and description. We took special note of vendors who changed quadrant (or who entered or exited this year’s list). Most vendors remained in their quadrant but slightly changed positioning. Feel free to jump around to reach each vendor’s performance in brief. 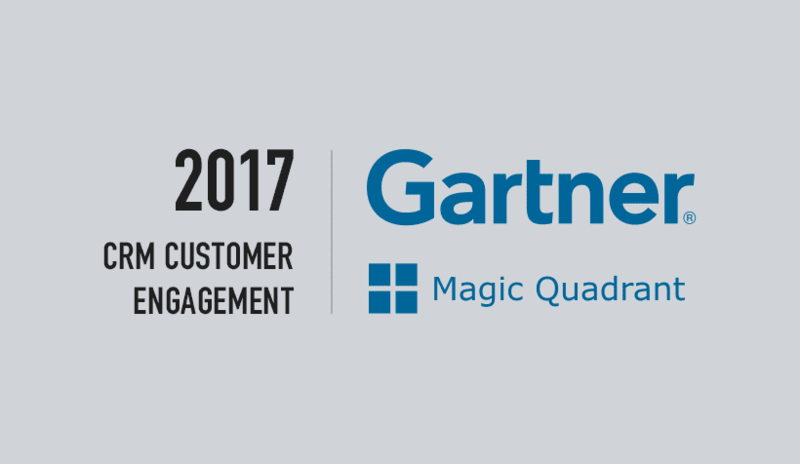 Without further ado, let’s dig into the Gartner 2017 Magic Quadrant for CRM Customer Engagement Center. Technical and design considerations remained largely the same this year as last — which stands to reason, as business clients rightly expect continuity from platforms that largely served them well the year prior — and Gartner again emphasized scalable, cloud-based systems, native mobile support, real-time and predictive analytics, multimodal capabilities (such as a chat feature within mobile self-service), social media engagement, context mining of voice and text, connection to the Internet of Things (IoT), support for self-service across device types and use of knowledge management. Certain considerations with similar titles were altered to accommodate the changing nature of the functional demand. For service products, last year Gartner emphasized ‘Suggested next agent action’; this year it’s ‘Agent guidance and nurturing’. Last year, there was ‘Industry-specific functionality and workflow’; this year it’s replaced by ‘Digital workflow/business process management support’. This could refer to an evolution in specific functional demands or simply the rise of new ones. Other considerations were dropped and new ones added. Last year, Gartner emphasized ‘Global instances of the system’ and ‘An adaptive business rule engine’; this year, Gartner added, ‘Messaging’ and ‘Automation of engagement using artificial intelligence (AI)-like bots and virtual agents’. This can be interpreted as an indication to the speed at which certain advantages become the norm and the potential for emergent technology to quickly become a competitive asset. Gartner slightly changed the weighting attributed to software functionality as well. Check the chart below for the weights given to specific functionalities. *Case management was evaluated on the basis of whether a vendor had control over the customer master data; in other words, proper data management of consolidated, real-time customer data. Note that certain functionalities were combined from 2016 into 2017. ‘Knowledge-based solution’ and ‘multisource search optimization’, which comprised 25% of the 2016 weightings, were together valued at 15% in 2017. Similarly, virtual customer assistants gained weighting. Okay, let’s get into the meat and potatoes of the 2017 Magic Quadrant. The moment you’ve all been waiting for — the highly anticipated Magic Quadrant has arrived. How do we know it’s highly anticipated? Because once released, every mentioned vendor and their cousin wrote a blog post or issued a press release. Okay, we get it! Gartner carries a lot of weight. 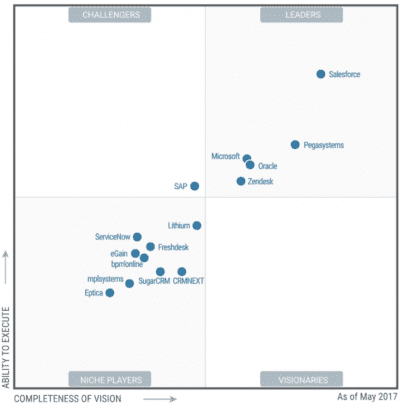 Well then, hear ye, assembled faithful — the Magic Quadrant for CRM Customer Engagement Center lieth below. And here you see the 2016 and 2017 Magic Quadrants for CRM Customer Engagement Center side-by-side for comparison. There was only one vendor that remained on the list but switched quadrant. Unfortunately for the vendor, the movement wasn’t in a direction it would have liked. Lithium, which offers products focused on online community and social media management, was downgraded by Gartner from visionary to niche, probably on account of changing market expectations. I say this because Gartner’s assessment of the San Francisco-based company remained essentially unchanged from last year to this year — noted Strengths included its leading social media customer support for a wide range of industries, its presence in key markets in North America, Western Europe, Asia and Australia, its strength in gamification and capability redirecting conversations from a public forum to a one-on-one context. Noted Cautions included lack of a core case management or customer service agent desktop, limited functionality customization and system extension and incomplete customer self-service feature set. Why the downgrade, then? Most likely because Gartner envisions the ground changing beneaths Lithium’s feet — while Lithium remains excellent for social media, it’s a solution best deployed in conjunction with a core case management tool (one with a customer master record). Everybody clearly still uses social media, but by Gartner’s estimation, that’s a little too 2016. Several vendors upgraded or downgraded their position within their quadrant from last year. Many of the names are ones you’ll recognize from last year, although their relative positions have changed slightly from previous years. Salesforce is the leader in the CRM space by market share; Gartner estimated that roughly 20% of its new revenue came from its Service Cloud last year. In terms of sales volume, this made Salesforce the leading vendor of customer engagement software. Salesforce benefits not only from the strong functionality of its increasingly-aligned business solution clouds, but also from its evangelized customers, who see Salesforce not only as a solution provider but as a strategic advisor. Particularly for customers using other Salesforce products, its Service Cloud is in high demand, and Salesforce boasts a large, global list of key system integrators and independent software vendors with exclusive extensions for the platform via Salesforce’s AppExchange. Salesforce, though clearly highly credible, suffers in the eyes of enterprises with complex business processes wary of migrating their data to the cloud. Some customers complain about maintenance complexity and frequent upgrades. Salesforce is not viewed by Gartner as a leading vendor for complex B2C service centers regarding its capabilities. Pegasystems’ latest iteration of its customer engagement solution — the Pega 7 platform — is highly regarded for its proficiency handling frequent changes in highly complex customer service processes in industries including banking, health insurance, high-tech manufacturing and recently, telecommunications. Pegasystems offers flexible, scalable deployment (it can accommodate 5,000 or more users) and its Pega 7 platform includes components for B2B sales automation, field service, decision-support and marketing. The customers Gartner referenced gave Pegasystems the best cost-to-value of any solution in the Leaders quadrant — a distinction that Pegasystems carried last year as well. Its SaaS revenue is its fastest growing revenue type for another year in a row, though it still comprised a fairly small percentage of overall revenue (from 5% to 8%). Nevertheless it seems Pegasystems’ customers are content to stick with their vendor as it makes traditionally on-premises functionality available on the cloud. However, Gartner found it remains a challenge to integrate Pega with real-time data sources as well as telephone infrastructure. Since last year’s Magic Quadrant, Microsoft has rebranded its Dynamics CRM as Dynamics 365, which sought to align its CRM and ERP suites. Its customer service software is an independent module within the Dynamics product offering. Microsoft offers flexible deployment options, and its cloud-based solution allows various subscription tiers or packages for SMBs and enterprises which include its customer service solution. Dynamics 365 allows straightforward customization tools, integration with Microsoft’s productivity tools (Office, Exchange, SharePoint, Azure Machine Learning, Cortana Intelligence) and it supports a wide range of languages. Dynamics’ repackaging makes the sole use of its customer service solution expensive — customers often must also subscribe to other Dynamics’ modules — and Dynamics, as a whole, lacks industry-specific depth. However, Microsoft is financially stable and committed to its CRM/ERP solutions, and leadership under CEO Satya Nadella seems to be moving it in the right direction. Oracle has indicated it won’t retreat quietly in the face of vigorous opposition from Salesforce and Microsoft. Oracle’s Service Cloud rolled out innovations since last year’s Magic Quadrant, including AI assistants, messaging channels and IoT connectivity. 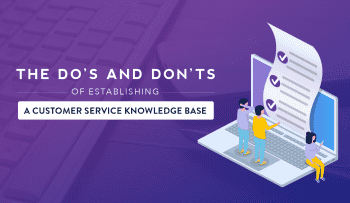 The Service Cloud offers complementary apps for customer self-service, field service, analytics and multichannel integration — in fact, its knowledge solution is one of the highest regarded among its peers. Oracle has made significant progress in aligning its Service Cloud processes with its broader Customer Experience Cloud suite. Gartner found some customers complained about Oracle’s support and pricing. Its case management functionality — the most heavily weighted of Gartner’s criteria — scored below average compared to other entrants to this year’s Quadrant, and compared to its peers, Oracle has a limited (though growing) number of independent software vendors designed apps exclusively for its Service Cloud. Zendesk has grown its customer base significantly over the previous year (Gartner estimates from around sixty thousand customers to one hundred thousand customers) with most of those customers fairly small implementations — twenty users or less. Zendesk offers an exclusively cloud-based product with several subscription tiers. Since the previous year, Zendesk has expanded functionality in several areas of its product, notably enabling SMS in Zendesk Talk, the ability to integrate channels (such as YouTube) into customer service interactions and the mobile web widget to add live chat on mobile devices. Zendesk also added analytics tools and improved CTI features as well as improved security monitoring. Zendesk, as a cloud option, can be deployed anywhere, but they chiefly have a presence in Western Europe and the U.S. However, Zendesk doesn’t offer industry specific solutions, they score rather low in social media engagement and content management, or configure and sustain complex customer support processes or user roles. SAP was slow to embrace SaaS for its CRM products. However, after launching several business application clouds, SAP is building momentum; its SAP Hybris Service Cloud is reporting 500 customers after a year of pushing the brand. SAP offers two customer engagement products — the Hybris Service Cloud and its on-premises SAP CRM 7.0. The Hybris Service Cloud offers three subscription tiers, but the customers Gartner referenced not not score it highly for stability or reliability. However, as SAP has recently committed more resources towards its cloud products than in the past — including its sales, marketing, service and delivery solutions — SAP’s credibility has improved over recent years. Gartner’s referenced customers found implementation to be complex, but were satisfied with SAP’s support. In addition, SAP has extended Clea machine learning to its solutions, which can extend towards AI-driven customer engagement. Multichannel integration is achieved through SAP’s YaaS microservices platform, which is not widely understood. Furthermore, while SAP certainly has the resources and has indicated the willingness to commit them to its cloud products, its customers view SAP’s products as more costly than its peers. Freshdesk provides a customer engagement platform for small to midsize organizations, the core of whom are U.S.-based and have fewer than 50 agents. The company has charted an aggressive course to expand its core functionality through acquisitions — it acquired seven companies in under two years — and raised an additional $55 million in funding. Freshdesk provides a friendly user interface and performs the core functions — case assignment and escalation — of customer service and case management very well. In addition, its Marketplace offers over 100 complementary apps to expand the core features of the solution. On the other hand, many of its out-of-the-box features lack the complexity of comparable solutions. Gartner found that reference customers actually scored Freshdesk’s customer engagement functionality below average for this Magic Quadrant. While Freshdesk does very well at simple customer service, it falls short for complex business processes, and it would benefit from further refinement in its sales and marketing capabilities to attract larger clients. Gartner estimated that privately-held SugarCRM’s revenue increased from roughly $100 million in 2015 to $125 million in 2016, and about twenty percent of that revenue came from its customer engagement products. SugarCRM typically caters to small and midsized support organizations and is available globally with flexible deployment and regular upgrades. Its customers score it highly for its core case management functionality, as well as ease of setup and management. SugarCRM uses an open source stack, which gives customers access to a wide variety of customization tools. SugarCRM is particularly useful for small to midsized B2B companies that already plan to deploy a sales automation solution. SugarCRM’s cost is below the average for the top five CEC providers. SugarCRM runs into trouble for enterprise solutions; its customers rank it below average for enterprise feedback management, advanced email management, knowledge management and predictive analytics. SugarCRM relies on partners to provide industry-specific customizations and doesn’t provide out-of-the-box industry templates. They are in the process of increasing their number of integrator relationships. Bpm’online is primarily recognized in central Europe and the U.K. and to a lesser extent, the U.S., Eastern Europe and Australia. Bpm’online offers flexible deployment options — cloud-based and on-premises — and is highly regarded by its customers for its simple setup, strong out-of-the-box customer service processes, straightforward case management and perceived cost-to-value. Gartner cautioned shoppers that bpm’online customers often turn to third parties for channels like social media, mobile chat and video. Gartner also hadn’t spoken with customers using bpm’online in complex customer service environments — retail banking, health insurance, telecoms. Bpm’online’s slightly-reduced ranking this year may reflect Gartner’s recognition that customers increasingly prefer a variety of channel options. Mplsystems is known for its strong industry knowledge and experience for retail, financial services, manufacturing and outsourced services. Its customers view it favorably for its customizability, scalability and flexibility. Its intelligentDesktop leverages natural-language processing within its email and chat functionality to simplify support for agents and self-service for customers. Mplsystems’ customer engagement deployments have historically been limited in scope. Gartner found its referenced customers give mplsystems low scores for its social and web community capabilities. Also, it’s still chiefly a U.K. entity — its customers are predominantly local or throughout Europe, and while it’s expanding, it currently lacks the network or technical resources to offer the same degree of service in other parts of the world. CRMNEXT is an India-based division of Acidaes Solutions whose platform emphasizes sales automation and customer service. It chiefly serves large companies and enterprises in financial services; its average customer support organization has over 10,000 users. CRMNEXT has a great presence in india, Hong Kong and Singapore and has begun operations in the U.S.
CRMNEXT is well-regarded for its built-in analytics, workflow capabilities, cost-to-value, flexible deployment options and ability to scale. Its professional services team has a strong understanding of business processes particular to the finance industry. However, it lacks presence and technical resources outside of India and parts of Asia, and some customers feel their social media engagement and mobile messaging functionality need improvement. Eptica is a Paris-based customer engagement solutions aimed at the European B2C midmarket, in which the average deployment has roughly 100 agents. It offers flexible deployment options and is geared towards building resources for customer self-service. Eptica invested for years in machine learning functionality, notably natural-language processing, which provides the basis for AI-augmented case management and customer service on text-based interactions. Eptica offers strong knowledge management capabilities with self-learning features. Its clients expressed strong satisfaction with most of Eptica’s solutions, including mobile chat, enterprise feedback management and video support. It doesn’t have much reach outside of Europe, though, and components of its solutions may be delivered by third-party vendors. 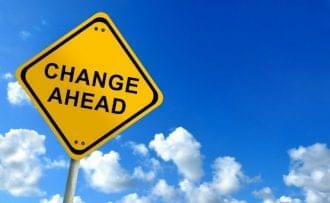 Gartner slightly changes their inclusion criteria every year, and vendors can be added or dropped from a list based on changing market expectations or the vendor’s change of focus. Therefore, inclusion (or exclusion) from the Magic Quadrant does not necessarily indicate Gartner’s opinion of the vendor’s health, but rather how accurately their product, strategy, and execution fit the criteria Gartner sets for the space. Two new vendors made it into the Magic Quadrant for CRM Customer Engagement Centers this year. eGain offers a suite of customer engagement solutions that support chatbots, real-time collaboration, virtual customer assistants and other AI capabilities. 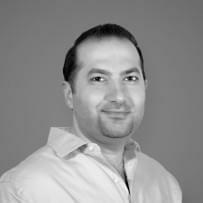 Based in Sunnyvale, California, eGain is mostly present in the U.S. and Europe. It provides strong knowledge management tools and an appealing trial experience for prospective customers — over 70% success rate — in which customers use the product for a few weeks at no charge or obligation to buy. eGain failed to turn a profit in 2016, which may be attributed to its transition to a cloud-based product. In the past, referenced customers have desired better professional services and technical support; in response, eGain launched a customer success program. It remains to be seen whether this program will allay their customers’ qualms. eGain has traditionally been used as a layer of apps helping customers navigate between channels in complement to a core case management system. However, the recently-announced v.17 may indicate eGain’s willingness to provide an all-inclusive customer support solution to round out its strong knowledge, social and email management capabilities. ServiceNow provides a fairly wide swatch of cloud-based business applications that range from IT service management to application development to HR. They bring in over $1.5 billion revenue; although their customer service system only amounted to $25 to $40 million, Gartner felt their large, global customer base alone could drive strong growth in their customer engagement software. ServiceNow performs well for workflow, automation, a friendly UI and out-of-the-box tech support functionality. Its customer service solution has very few bugs, as it’s built from ServiceNow’s tested IT service management solution. However, the customer service solution is still quite new, so as yet it offers limited integration with complex legacy back-end systems, immature testing environments for modern channels, and somewhat of a lack of professional services tailored to this solution. There was one vendor that Gartner removed from its 2017 Magic Quadrant for CRM Customer Engagement Centers, though they were quick to remind us might not indicate a change in their opinion of the performance of the vendor — more of a change in Gartner’s interpretation of market conditions and the vendor’s strategy or development. Verint produces an Engagement Management product that provides case management, process modeling and customer service tools, including self-service. Verint products span web applications, mobile channels and agent desktops. The Engagement Management platform can be configured for multiple user roles and can implement other Verint products including options for workforce optimization, fraud detection, risk management and compliance. Last year, Gartner had difficulty finding recent Verint deployments as customer engagement centers that spanned multiple countries. In addition, the geographic availability of local professional services personel for Engagement Management in particular were sporadic. This year, Gartner felt that Verint’s mix of customer and employee engagement didn’t align with Gartner’s 2017 inclusion criteria for Customer Engagement Centers — instead, it best fits the Workforce Engagement Management — which isn’t to say Verint won’t reappear in the future. Most vendors offer a SaaS product with core case management functionality and additional features, or at least a complementary SaaS application for a specific capability, like knowledge management, feedback management, or web or video chat. Gartner predicts that in 2017, complete SaaS customer service solutions will remain most prominent in B2B contact centers with fairly simple business processes. It seems large companies with existing on-premises solutions handling complex processes will remain reticent in making a full-scale shift to a cloud-based solution. This is particularly true in certain industries or countries with concerns over data residency, latency or application availability. Regionally, this applies to Central and Eastern Europe, India, China, other parts of Asia and South America. For industries, this applies to national governments and healthcare organizations subject to regulations. Another year, another Gartner Magic Quadrant for CRM Customer Engagement Center. (That’s a mouthful of a title.) Kudos to Gartner’s staff for doing the legwork to produce a comprehensive snapshot of the state of customer service and engagement platforms. Looking for a customer service solution? Check out our free comparison guide for helpdesk ticketing systems.